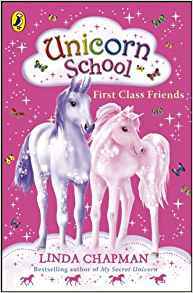 Unicorn School is by the same author as My Secret Unicorn. These books are about 4 Unicorns getting trained to fly and getting to know the life of a Unicorn! This book is about a pink unicorn named Willow. She has friends that are also more main charecters. Storm, Sapphire, Troy, and Oriel. There may be another but I really don't think so. Willow goes to Unicorn School as a first year. Storm is having trouble flying and making unicorns spin in the air without being able to stop. Meanwhile, Willow is having trouble with Oriel. He is a much older unicorn then Willow and her friends. He is also VERY mean and tricky. He dares Willow to go to High Winds Pass and stand while counting to ten. You are not allowed at High Winds Pass without a teacher coming with you. Last time Willow was at High Winds Pass, she almost got blown right off a cliff! Will Willow really take the dare? I like unicorn school because of the pretty pictures. I read this book when I was a lot younger and I actually quite enjoyed it. I would definitely say it's for younger ages but has lots of adventure and sweet characters, so give it a read!